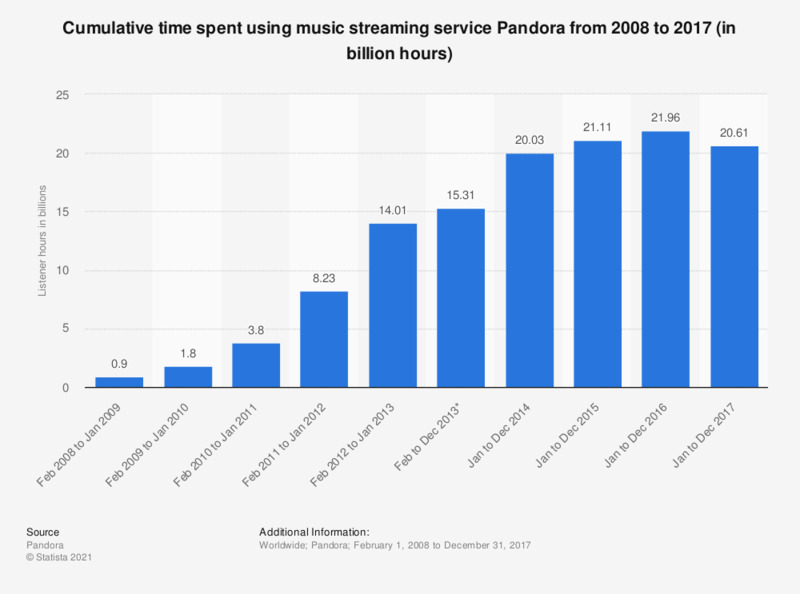 The statistic contains data on the collective time Pandora's users spent using its services in the fiscal periods from February 2008 to December 2017. In the fiscal year ending in December 2017, users listened to an aggregate amount of 20.61 billion hours of streamed music via Pandora. In 2017, 32 percent of consumers in the United States stated that they had used the service in the last month and a further 23 percent had used it in the last week. Pandora is the leading online radio company in the United States, constantly averaging well over two million average active sessions. As of the end of 2016, the internet streaming service had 81 million active users in the United States, up from less than 30 million in 2011. Another contributing factor to Pandora’s success in the recent past was the increase in the amount of time consumers in the U.S. spent listening to online radio. In 2009, people spent an average of 391 minutes per week listening to online radio, an amount which had more than doubled to 879 minutes per week by 2017. Online radio allows users to listen to music on a wide variety of digital devices, making it easily accessible. However, one of the main ways that streaming companies make money is through advertisers, allowing companies to reach their consumers wherever they are. In 2016, Pandora's advertising revenue exceeded one billion U.S. dollars for the first time, a massive increase from the advertising revenue of less than 500 million U.S. dollars in 2013. Figures prior to 2015 come from earlier financial releases.